4 Musts for Carnivore-Approved Veggie Burgers. 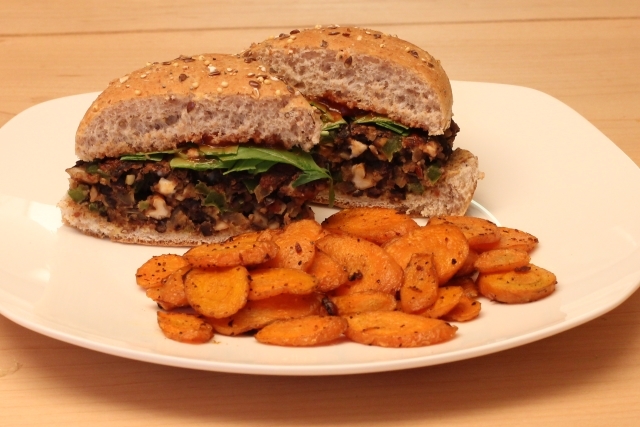 In our opinion, veggie burgers tend to be lack-luster because of their terrible texture and lack of umami; we believe this is typical for most meatless meat dishes. When you cook raw meat, the fibres in the meat cling together at different rates, depending on the meats level of doneness and give the eater a variety of textures and flavours from a single piece of meat. This transformation simply does not happen when cooking already cooked beans. The beans have already gone through their cooking transformation already and when left as is, does not make a good burger, regardless of fixings you add to it. This is why, generally speaking, we dislike any vegetarian version of a meat dish. They just don’t add up. But through trial, error and research we put together a recipe and 4 “musts” that changed our mind about veggie burgers and may even convert a meat eater or two.1) Bake your beans first! This step provides the single greatest change from a typical bean burger. After rinsing (or cooking if you’re not using canned beans) the beans, toss them in a little cooking oil (canola works well) and bake the beans in an oven at 400F until they split and the insides start to brown a little, approx 15-20 minutes. This step is critical! 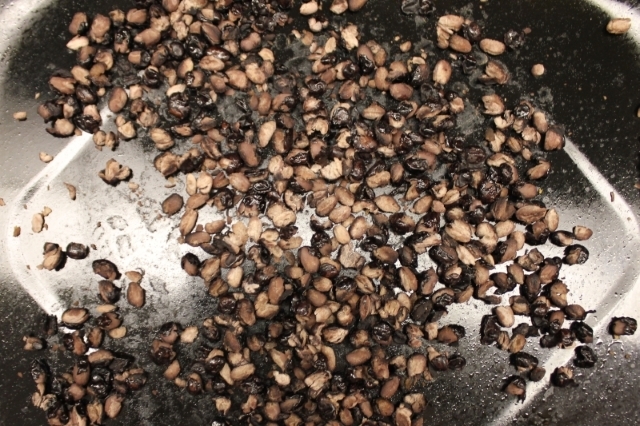 It removes much of the water content from the bean, condenses the flavour and also adds flavour through the browning/toasting of the beans. The result is a much less mushy burger texture and a much deeper flavour. 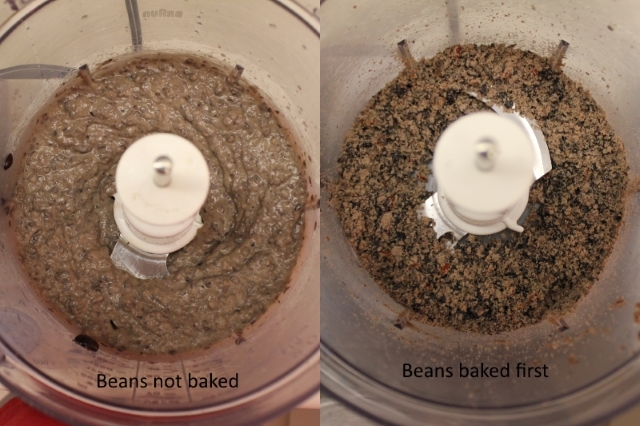 Notice the texture difference between the baked and non-baked beans after blending. The non-baked are clearly mush, whereas the baked ones are more of a chunky moist powder. Huge difference!2) Sauté your veggies first.I cannot think of a case where it’s better to put raw veggies into a loaf/patty than their sautéed counterparts. Like baking your beans, sautéing adds flavour and reduces moisture content. This gives the end product a much more desirable flavour and firmer texture.So while your beans are baking sauté up whatever veggies you want to add to the burgers. The world is really your oyster here and it’s up to you. 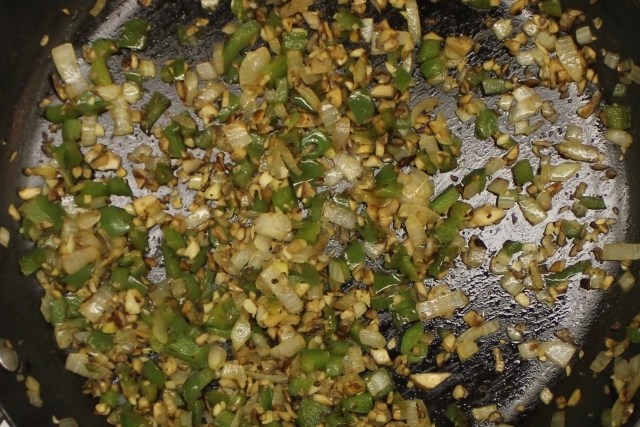 We like onions, green peppers and mushrooms.